A surgeon prepares for a surgery at a hospital in Chongqing, April 27, 2017. In June 2015, doctors told 69-year-old Shuai Shuiqing she had stomach cancer and would need surgery. She left her home in the city of Chongzhou in Sichuan province and traveled 20 miles to visit Chengdu’s Huaxi Hospital, which is ranked second best in all of China. There, she waited six weeks to see a surgeon. By the time she went under the knife, she had already gone into shock. The surgeons found the cancer had metastasized to other organs, and she died a year later. It’s hard to know whether earlier surgery could have saved Shuai’s life, but her case points to a growing problem in China, namely that demand for healthcare is far outpacing the country’s capacity to provide it. Patients often face dangerous wait times for surgery, not because China lacks surgeons, but because there are not enough surgeons who can actually operate. According to World Bank data, China’s number of surgeons per capita is on par with other upper-middle income countries, but collectively, its surgeons perform 40 percent fewer surgical procedures than their counterparts. As an American medical student conducting a study on surgical education in China, I arrived in China knowing these statistics. Still, coming from the “see one, do one, teach one” ethos of the U.S. system, where medical education jobs are among the most prestigious forms of employment for doctors, I was stunned by how little hands-on teaching there is in Chinese academic medical centers. I discovered it was typical for young surgeons to spend decades waiting for a chance to stop observing and start cutting. In America, surgeons grant trainees maximum possible autonomy given safety and practical constraints. American senior surgical residents are expected to complete many surgeries independently, with attending physicians merely supervising and assisting their work. Beginning my own surgery rotations, still two years away from getting an M.D., I was expected to be scrubbed in and ready in case a scalpel was handed to me, which it was, on my very first day. In China, the learning is more delayed. Take, for example, an ophthalmologist at a top-rated hospital in Beijing, who asked that her name not be used in this story. After securing an M.D. and Ph.D., she graduated from a top residency program, and is now an attending ophthalmologist at a prestigious eye hospital. On top of her busy training schedule, she has managed to publish dozens of peer-reviewed research articles. I asked her how many cataract surgeries she’s done. “Zero,” she said. “I’ve seen a bunch but haven’t actually gotten to do any myself.” An ophthalmologist in the U.S. would have completed scores, if not hundreds, of such surgeries by her stage of career. She told me she hopes that she can begin operating in the next decade or so. With many surgeons only able to operate after mid-career, if at all, the system creates a bottleneck that impacts patient care. For example, in a country where half of all blindness—2.5 million people—is due to un-operated cataracts, only 36 percent of Chinese ophthalmologists perform the surgery. As a result, China has a per capita cataract surgical rate many times below that of lower-resourced Vietnam and India, and well below the United States, where less than 15 percent of blindness is due to cataracts. Highly qualified surgeons tend to concentrate in large academic centers, leaving smaller hospitals with a lack of experienced doctors and large hospitals swarmed with patients seeking specialized care. According to Gong Xiaoming, an Ob/Gyn at Peking Union Medical College in Beijing, this situation has resulted in rural patients’ standing in line for days in the freezing Beijing winter just to get a simple biopsy. 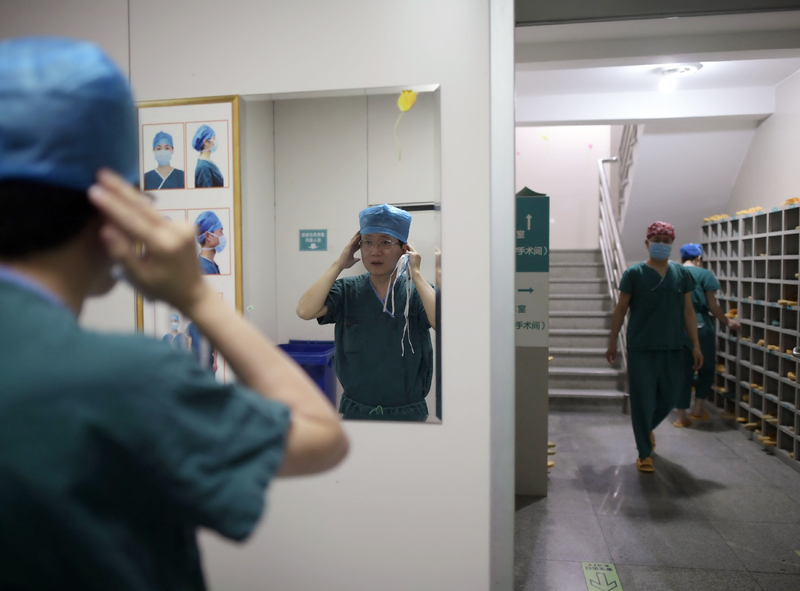 The problem of surgical training stems from a central flaw in China’s medical system: namely, deep societal mistrust of overworked, underpaid doctors. Doctors in China generally do not enjoy the same high salaries and social status they do in many other counties. The average annual salary in 2015 of a Chinese doctor, adjusted for purchasing power, was around U.S.$27,000, which is many times lower than the average physician salary for OECD nations. Chinese surgeons are primarily evaluated—and compensated—based on surgical output. In an environment where most doctors already feel underpaid and overworked, this leaves little time or incentive for teaching. Many senior surgeons avoid training future surgeons, says Jiang Yuzheng, an ophthalmologist and expert in surgical training who studied medicine in both China and the U.S., because they are reluctant to turn a trainee into a “competitor.” Gong of Peking Union Medical College describes surgeons as feeling a “conflict of interest” in training a future generation of doctors. Senior surgeons may also fear violent backlash from patients. Zhu Zhenglun, a surgeon and professor at Shanghai Jiao Tong University School of Medicine, told me senior surgeons fear being blamed for their trainees’ performance, so senior surgeons do the surgeries themselves. Families will often hold doctors responsible for even unavoidable complications, and such conflict can quickly turn violent. One study in The Lancet found that 96 percent of Chinese hospital staff reported being abused or injured by patients or their relatives in 2012 alone. Making matters worse, because the public is aware that junior doctors often lack experience, they are trusted even less. “If the operation is done by a young surgeon, the patient will be angry. This will be bad for the hospital. So senior doctors and deans of departments are afraid to let the young surgeons do the surgeries themselves,” Zhu said, adding that many patients refuse to pay for surgery performed by a junior surgeon. Rather than operating, surgical trainees are often relegated to administrative tasks. Hu Mengbo, a urology trainee at Fudan University in Shanghai, explained that he spends most of his time making sure things run smoothly for the senior surgeons and “little time is spent learning.” Hu has completed medical school, a general surgery program, and more than one year of his advanced urology training, and he is currently only trusted with simple procedures like circumcision and bladder scoping. At the end of his training program, Hu will not be required to demonstrate any advanced surgical skill to graduate. He told me he does not expect to be able to perform more complex procedures, for example the operations cancer patients often require, until he is in his 40s. Gong, the Ob/Gyn in Beijing, described a similar situation in his field: even after completing training, his colleagues often have not performed a caesarean section independently. In the United States, by comparison, Ob/Gyn residents must complete 145 caesarean sections to graduate. Poor training, low pay, and hectic work life mean doctors in China do not enjoy the same prestige that they do in other countries. College students have told me that many doctors only enter medical school because their test scores were not good enough for more attractive professions such as engineering, AI, or government. Of those who do complete medical school, only 20 percent choose to practice after graduating, further shrinking the pool of qualified doctors. This means patients must wait longer and jump through more hoops to receive care. An illegal but increasingly sophisticated industry has sprung up to help patients secure appointments faster. Intermediaries often lurk around hospitals, like scalpers outside a stadium, selling pre-booked appointments with specialists for U.S.$400-$700. These profiteers also sell their services on social media platforms, despite recent crackdowns. Through them, patients with the ability to pay can expedite the hospital registration process that, otherwise, can take days. As patients face long waits and high costs, frustrations around healthcare have built to a fever pitch. According to sociologist Jiong Tu, Chinese citizens are increasingly venting their frustration in public, displaying corpses in front of hospitals, destroying hospital property, and attacking hospital personnel. Such disturbances are estimated to number in the tens of thousands annually. Armed police, a rare sight in most areas of China, now guard hospitals to prevent violent attacks on hospital staff. Before the market reforms of the 1980s, healthcare was guaranteed by the government, and nearly everyone received care, however basic. Now, patients must raise enormous sums or be turned away, leading to the perception that hospitals and doctors care more about the bottom line than the individual, according to Tu. To improve medical training, China has begun shifting towards a formalized residency training program, with the Ministry of Health issuing mandatory training standards in 2012. Still, progress has been slow and fitful. According to many doctors I’ve spoken with, residents are still graduating from their programs without being able to operate independently, with few opportunities for real learning. Data from a study after the new standards were to be implemented showed that trainees from top ophthalmology residencies performed an average of zero cataract surgeries—in the U.K., by contrast, trainees must perform 350. Even after the reforms, Zhu, the Shanghai surgeon, noted that would-be surgeons are tested on their book knowledge rather than their surgical skill. According to Jiang, trainees do not log their participation in procedures to ensure that they are hitting new benchmarks, as they do in other countries. Many trainees themselves are also unhappy with the new program due to the additional time spent earning meager resident salaries, which the government sets at less than U.S.$100 per month. In late 2017, President Xi Jingping declared healthcare reform a priority for his administration. Since then, little action has been taken, and it is unclear what changes Xi has in mind. One possibility is the implementation of a “gatekeeper” model where patients will no longer be able to freely travel to any public hospital. This would alleviate the congestion at the large academic centers but leave rural patients stuck with largely underqualified doctors in their hometowns. This move, though harsh if implemented quickly, would be consistent with Xi’s push to declutter cities of outsiders. Given the current failures, the burgeoning private healthcare sector is also poised to capitalize on the need to train China’s surgeons of tomorrow. Jiang recently started a for-profit company that aims to connect qualified surgeons with eager trainees. Gong also hopes to set up a private clinic, thinking that with better compensation at private centers, there will be no need for any under-the-table money and more time for teaching.